Another one of our very special greyhounds has crossed the Rainbow Bridge. Doug Boy (Wugs) was adopted by Jackie and Curt from Craiger’s List. He came to us from another group. 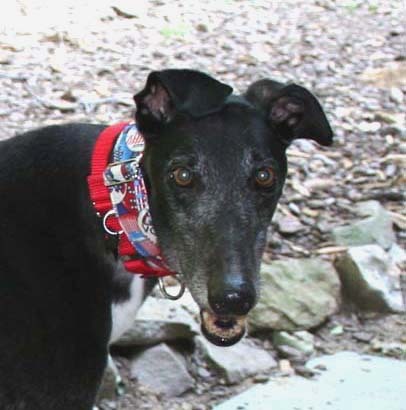 He had been adopted by a kennel worker when he was done racing but his owner died, leaving Wugs without a home. We saw his story and offered to bring Wugs here to find him a home. Wugs was adopted by Curt and Jackie in July of 2009. Although he was in his home a relatively short time (a little more than a year), he was greatly loved. He developed problems with incontinence and had other neurological issues. Lissen up: Keep your eyes out for Doug Boy. He’ll is joining you at the Rainbow Bridge today. He’s a huge black boy with a very grey muzzle. Take good care of him ’til Jackie and I join him. He’s not too tough–oh, he’ll pay more attention if you call him Wuggles. He’ll tell you he was a VERY good boy, but that his neurological stuff started to fail. He often didn’t know who he was or where he was or who we were. Wuggles: thanks for the joy and love you brought us. We will remember you forever. Nora says “Hi.” elsif sends a growl. We are always sad to hear of one of our Craiger’s List dogs passing. But we know that there are special people who do not mind that they are older, infirm, not necessarily the most adoptable dogs and/or may have only limited time. We are thankful that Wugs had the chance for happiness and love in his last year of life. Since dogs live in the moment, Wug’s last moments were spent with those who loved him. Godspeed, you wonderful boy. You were truly special and we know you have a special place at the bridge.